The eBags TLS Mother Lode Weekender Convertible was featured in the San Francisco Chronicle Travel section in December 2009, receiving the Best-of-field award for design, materials and value. Since then, it has only gotten better. 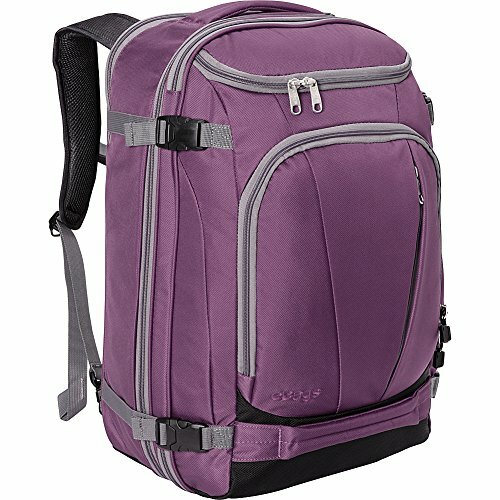 Quite possibly the last Travel Pack you may ever need, this Carry-on Convertible backpack is loaded with smart features and is sized to hold all of your most important items. The laptop sleeze protects up to a 19" laptop and the TLS Mother Lode Weekender is made from a strong twisted poly fabric. Inside you'll find tons of organizational compartments and a fold-down shelf that splits your main compartment in half. There's also a zippered mesh lid panel, tie-down straps, and hideaway backpack straps. All this comes in at a light weight 3.7 pounds, making it a versatile option to suit your unique travel style. DIMENSIONS: Exterior Dimensions - 22" X 14" X 9"; Linear Inches - 45"; Main Compartment - 21.5" H x 5.5" D x 13" to 14" W; Front Compartment - 21.5" H x 3 to 5" D x 13" to 14" W; Laptop Compartment Dimensions - 19" X 11.75" X 1.5"